Dr Jude Weidenhofer is taking her fascination for molecular biology to the next level, as she works to unravel the intricacies of extracellular signalling mechanisms to improve the accuracy of prostate and breast cancer diagnoses. “I always enjoyed molecular biology in my undergrad degree. I didn’t know what I wanted to do but I knew that I wanted to help. Many young people who want to help patients go on to be doctors, but I wanted to do the kind of helping that helps them." Although survival rates for breast and prostate cancer have improved over the last 30 years, there are still ongoing problems with accurate diagnosis and therefore treatment. Both PSA tests (prostate specific antigen, a pathology test used to assess prostate cancer risk) and mammography screens can be problematic to interpret when it comes to patient prognosis. “One of the biggest problems is that while we're quite good at treating some cancers, those treatments, and even just the prospect of that treatment, can really affect a person. There are a lot of false positives and false negatives, and so much patient anxiety associated with the diagnostic process." “Some of these cancers grow so slowly that patients don’t actually need to undergo these drastic treatments in order for them to maintain their standard of living." In recent years, exosomes – vesicles secreted by the cell – have become a common theme of medical research. Exosomes are therefore an exciting potential cancer biomarker, and also give clues into the mechanisms behind cancer itself. However, when it comes to physically researching them in the lab, exosomes are very tricky to work with. “How do you define it? How do you know that’s what you’re looking at? There are ongoing discussions in the research community about what exactly constitutes an exosome and how scientists can verify that that is what they have isolated. One of the reasons this suggestion had irked Jude is that she had been working on the group of tetraspanin molecules for many years before they were identified in this context. Tetraspanins are located in the cell membrane and are responsible for assembling signalling complexes. They are known as scaffolding proteins, meaning they anchor lots of proteins together at one site of the cell membrane. 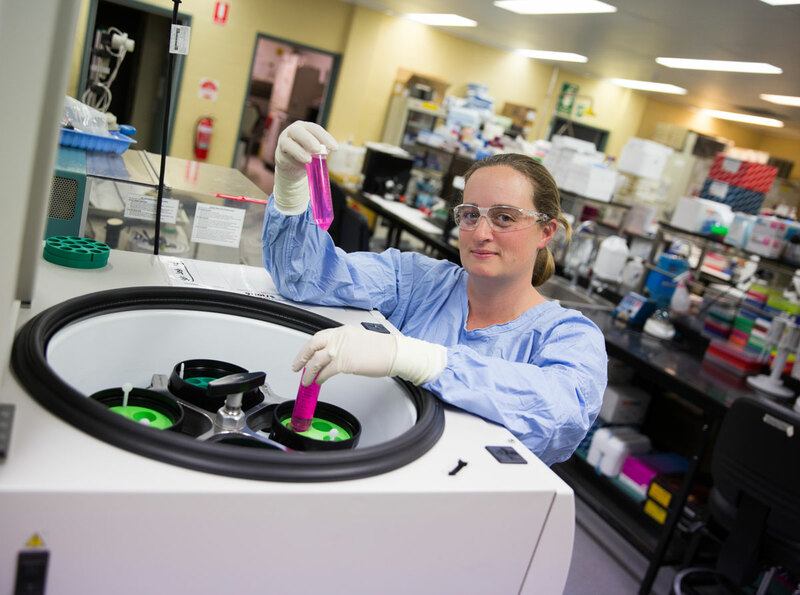 As part of her work funded by the Prostate Cancer Foundation Australia, in collaboration with Professor Leonie Ashman, Jude’s focus had been on tetraspanins as they have been proposed to have prognostic potential in prostate cancer biopsies. And so Jude found her expertise coming into play in a whole new field of cancer research, thanks to funding through HMRI from a generous donation by the CFMEU Northern Mining and Energy Division. “As prostate cancer progresses, there is less CD9 expressed on the surface of the cancer cells. But they are still packaging the protein into their exosomes which they release. “We still don’t know why." One question that Jude is keen to explore in her current research is the role that CD9 plays in affecting what message is sent by exomes to other parts of the body. "You can't have a signalling body like an exosome which isn't selective - what would be the point?" By genetically modifying the CD9 protein in a variety of prostate and breast cancer and normal cell lines, she is looking to identify just what it is this protein and the mysterious exosomes are up to.